Judder News, 7/5/14 | JUDDER! Good afternoon, law-abiding citizens of Judder! Well we’ve made it back from the dark ages, and can report that our medieval Judder crew sure know how to party! It was a most splandid evening resplendent with gallant knights, comely wenches, a full troupe of jesters and many other miscreants, all intent on partying like it was 1199! Thanks to DJ Crispygoth who played two splendid sets of banging tunes, and a special whoop to our resident DJ KungpAu for bringing the mead for the early birds. I am particularly looking forward to the official photos from this one as some of the costumes were spectucalar, and as usual there are a handful of photos on the Judder Facebook already with more to be added to the gallery soon. 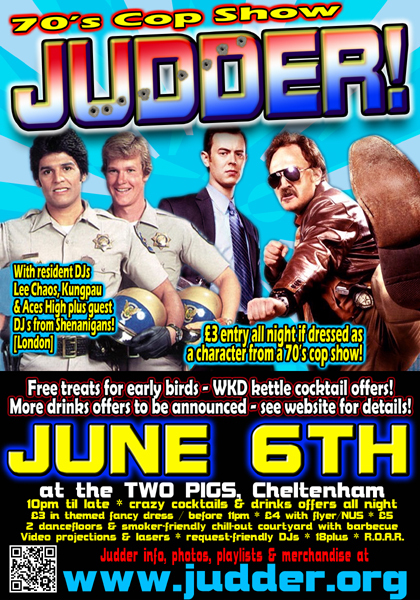 So, it’s quite a gap until our next event, which is our 70’s COP SHOW JUDDER on Friday June 6th – plenty of time to dig out the mirrored aviators, grow that handlebar moustache you’ve always wanted, and polish your badge! Entry is just £3 in fancy dress, and we are joined buy guest DJs from Shenanigans in London, so the night is sure to be a party like none other! Right, I’m off down the gun range to get ready to strike fear into the hearts of the perps and felons – see you on 6th June!